I tried this salad for the first time in Cincinnati. I will admit I didn’t think I would like it. Something about the flavor profile didn’t strike me, but I was willing to give it a go! I live an adventurous life, right? No, not really, but I will try this. 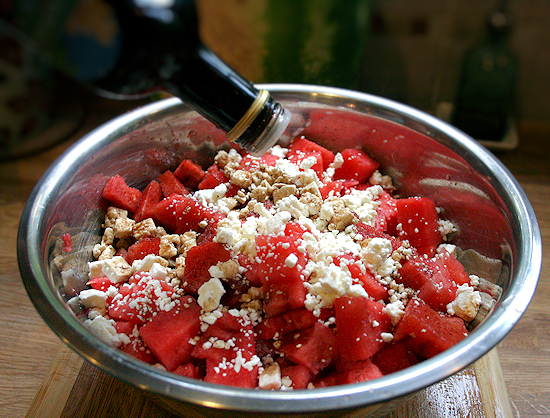 The feta, balsamic and the watermelon go so nice together. It’s a tangy sweet thing that it has going on. It was just perfect and so refreshing. By the end of the night, even my daughter was nibbling. I had to use this recipe for my picnic today. So let me explain why mine is NOT seedless. 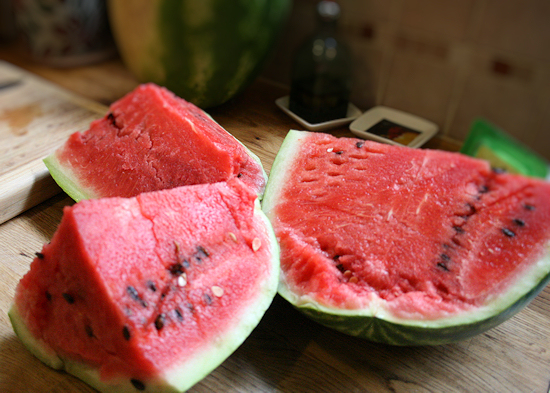 I went to open my pretty seedless watermelon, and well it seems it had gone off! 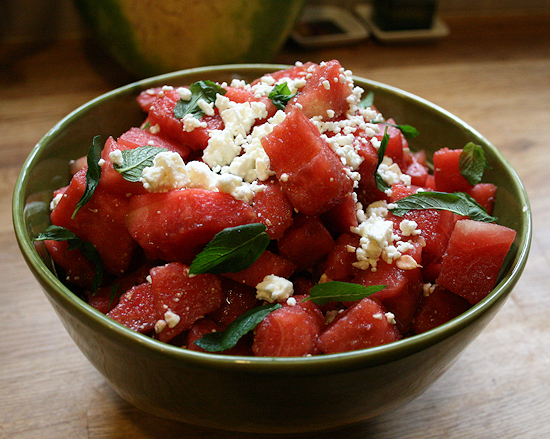 Have you ever smelled an “off” watermelon? My advice is don’t. I thought if felt odd, but nooooo. I didn’t listen to my gut and I cracked that baby open. Next time I will listen to my gut! So, after running around trying to get something secure enough to tie this up and throw it away, I had to run out for another watermelon. 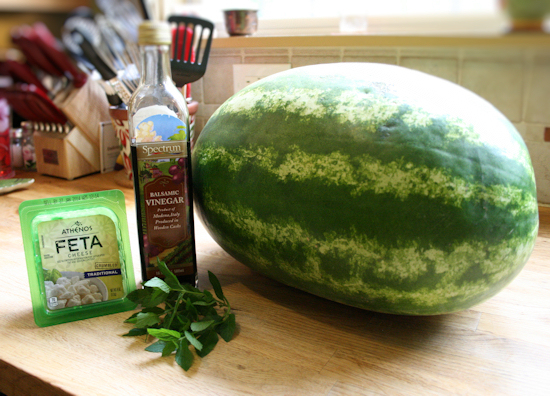 When I got to the farmer’s market, all they had was this HUGE expensive watermelon. So I shelled out the money and ran back home. I only had an hour before people were going to start showing up for this picnic, so that is why I had to pluck each seed out. 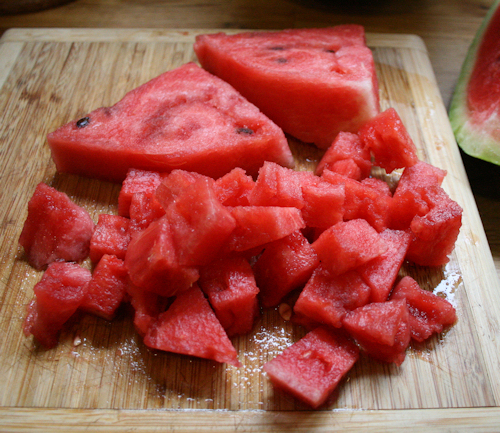 We will assume you went the smart route and got the seedless. 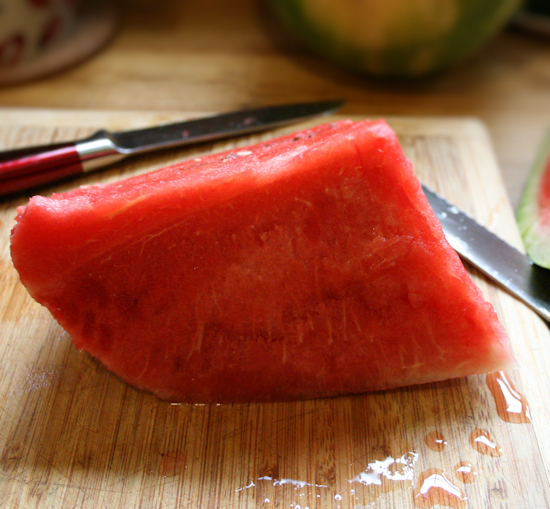 Slice your water melon into quarters and slice the rind off of the bottom. 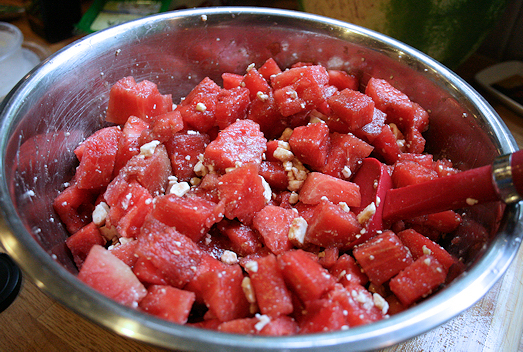 Cut into small but nice size chunks. 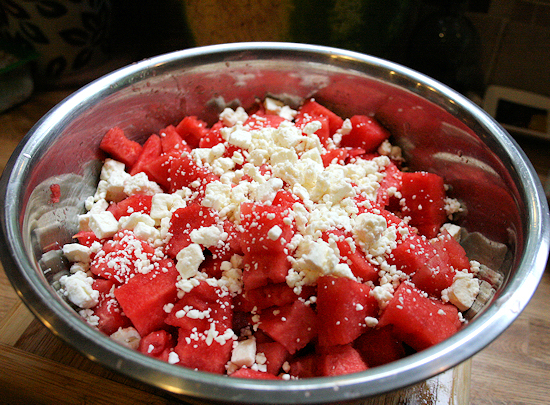 Add to a large mixing bowl, and add all but 1/4 cup of the feta to the bowl right on top. Pretty, isn’t it? Go ahead and try one bite. Add in the balsamic. You can measure it out or eyeball just be sure that initially, you do not add too much. Stir everything together until well tossed. 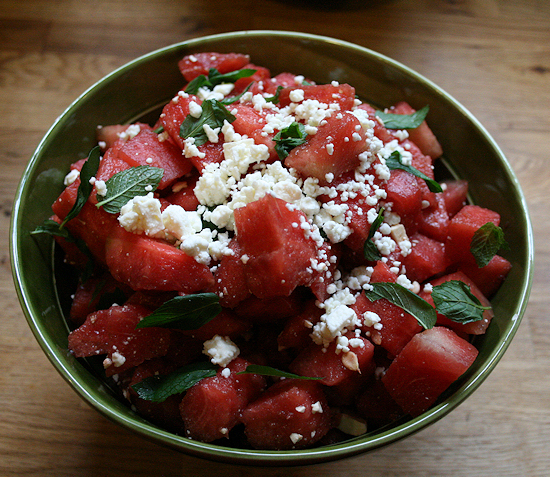 Put into a pretty serving dish, after all this is a picnic with guests coming! 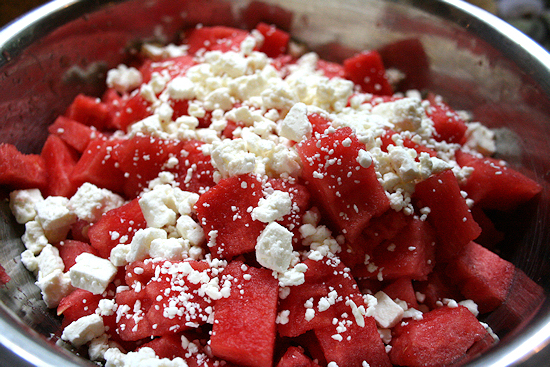 Now you can sprinkle the remaining feta over the top and shred some mint leaves. The color is amazing but the taste is even better. Great minds think alike. 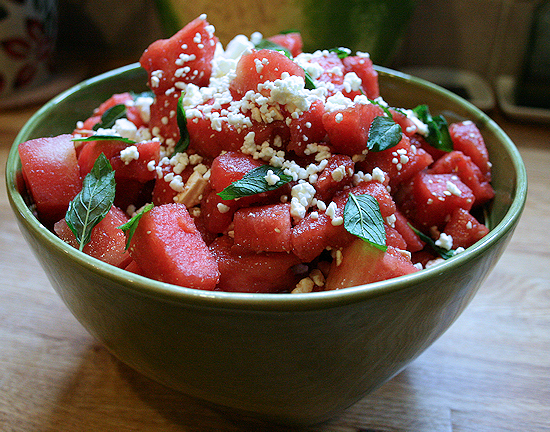 I also just posted on watermelon salad. My recipe is a little different than yours. Next time I am going to try using balsamic vinegar. Take a look at my recipe and let me know what you think. Oh! Yes the Balsamic Vinegar brings out the sweetness it is wonderful try it on strawberries too!! Never thought of Olive oil!! Nice to have options!